Austria has filed a legal complaint against Germany’s BND and the United States’ NSA intelligence services alleging activities targeting its authorities and companies, the country’s interior minister said. "Austria demands clarification," Interior Minister Johanna Mikl-Leitner told Reuters on Tuesday. "Today we have filed a legal complaint with the prosecutor's office against an unknown entity due to secret intelligence services to Austria's disadvantage." 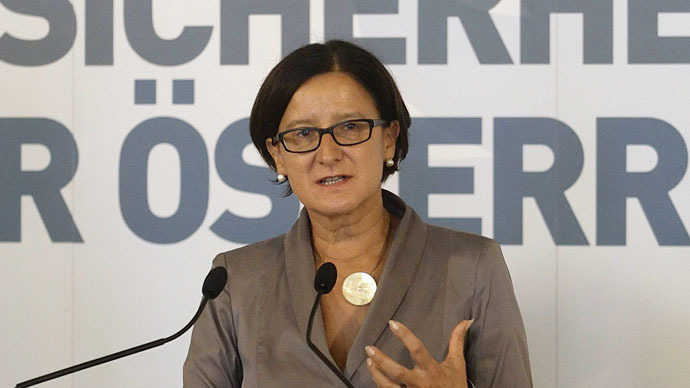 Adding that Austria’s security authorities have stayed in contact with their German counterparts, Mikl-Leitner said that "There is no concrete evidence yet. It's not far-fetched to suspect that Austria was also spied on.” He went on to say Austria is set to involve diplomatic and judicial channels in finding a solution and “full amplification” to the current situation. “Both ways are important and right,” he told APA news agency. On Monday, Chancellor Angela Merkel for the first time officially commented on the allegations that Germany’s intelligence agency BND illegally helped the US spy on European firms and officials. "This ability to carry out its duties in the face of international terrorism threats is done in cooperation with other intelligence agencies—and that includes, first and foremost, the NSA," Merkel said, underlining the idea that the first priority of Germany's foreign intelligence agency was to ensure the safety of its own citizens. US whistleblower and former NSA contractor Edward Snowden had previously revealed the scale of Transatlantic intelligence collaboration, stating that the BND has supported the National Security Agency for at least a decade. The BND was reportedly passing sensitive records, such as the telephone numbers and email and IP addresses it obtained, to the NSA. The French government and the European aviation consortium, Airbus, have supposedly fallen victim to their activities. "We are aware that as a large company in the sector, we are a target and subject of espionage," Airbus said in a statement to AFP. "However, in this case we are alarmed because there is concrete suspicion of industrial espionage."